Parkland student dies in ‘apparent suicide,’ police say. It’s the second death to rock the school in a week. 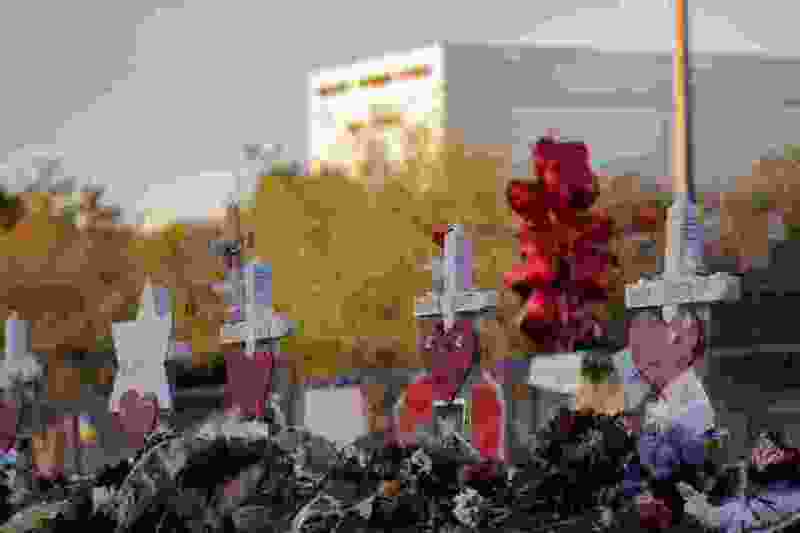 (Gerald Herbert | AP file photo) In this Feb. 19, 2018, file photo a makeshift memorial is seen outside the Marjory Stoneman Douglas High School, where 17 students and faculty were killed in a mass shooting in Parkland, Fla.
A student from Marjory Stoneman Douglas High School died in an “apparent suicide” on Saturday night, Coral Springs, Fla., police said, just a week after a 19-year-old survivor of the 2018 mass shooting at the school took her own life. A week ago, the Parkland, Fla., school was shaken by the death of Sydney Aiello, who took her own life. She struggled with survivor’s guilt and had recently been diagnosed with post-traumatic stress disorder, her mother told CBS Miami. Aiello was a senior at Stoneman Douglas last year when a gunman killed 17 students and school staff. One of her friends, Meadow Pollack, was killed in the shooting. News of the student’s death comes on the first anniversary of the March for Our Lives, the massive student-led demonstration against gun violence that was held in Washington and several other U.S. cities.